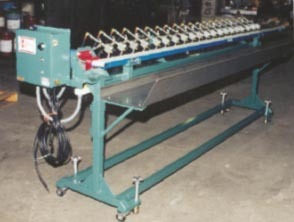 The Al-Be Model AB blow-off conveyors are typically used for small tubing, pipe, or profile in cut to length applications. Our standard models range from a 3" wide by 8' long belt to a 6" wide by 16' long belt. All our conveyors come standard with FDA approved belting. Each air nozzle is individually controlled by its own solenoid using much less air than required in a typical accumulative air system. The Model AB conveyors can be coupled with our Al-Be puller/cutter systems or configured to operate with your existing puller/cutter system. 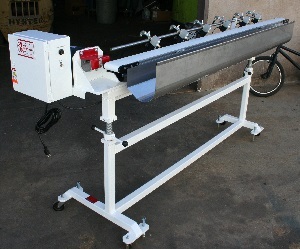 All our conveyors are manufactured in Fullerton, CA. For additional information, please contact the factory.